Will Molten Salt Outdo Batteries for Grid-Tied Storage? Renewed CSP development is driving gigawatt-hours’ worth of new molten salt storage capacity. Thermal storage hasn't garnered the level of industry attention lately as battery storage, which is experiencing quickly falling prices and rising deployments. But thermal storage, and molten salt in particular, actually exceeds the capacity of battery storage in operation so far, according to a new report from the International Renewable Energy Agency. A recent resurgence in concentrated solar power development promises to increase that advantage. Molten salt technology represents three-quarters of the thermal energy storage deployed for electricity applications worldwide, the study says. These applications typically support CSP projects, letting them dispatch electricity outside peak sunshine hours. Grid-tied molten salt storage volumes beat those for batteries by mid-2017, according to U.S. Department of Energy figures cited in the report. Although the data is for power output only, it shows molten salt weighing in at 2.5 gigawatts versus 1.9 gigawatts for all forms of electrochemical storage. In energy terms, though, the difference is expected to be much greater, since the bulk of large-scale battery applications to date have tended to be in the seconds-to-minutes range, while molten salt is rarely used for less than 30 minutes of storage. In 2016, commissioned parabolic trough plants featured either 7- or 9-hour duration storage, according to the International Energy Agency’s Renewables 2017 report. Parabolic trough is the most commonly used technology for CSP, but it is rapidly being superseded by power towers. These typically offer even longer storage durations. 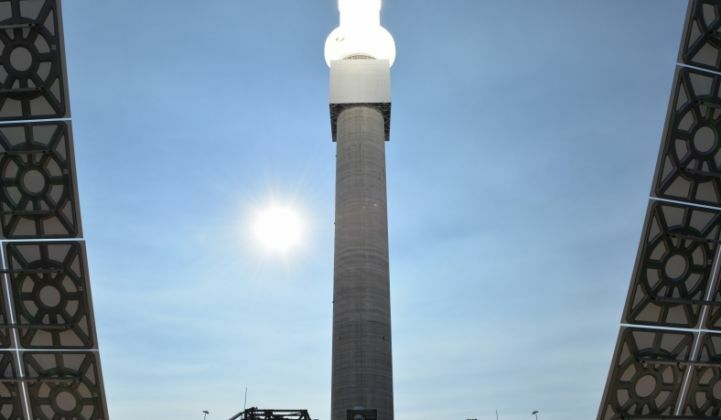 SolarReserve’s 110-megawatt Crescent Dunes power tower, for example, has 10 hours of storage. The company’s 100-megawatt Redstone power tower project, due in 2020, will have 12 hours of storage and the 260-megawatt Copiapo plant, scheduled for 2022, will have 13 hours. These are not exceptional: a plant in Chile, Cerro Dominador, is planned to have 17.5 hours of molten salt storage if its owner EIG Global Energy Partners can find $800 million to restart the project after its original joint venture partner, the distressed Spanish firm Abengoa, pulled out. In energy terms, the storage volumes involved are massive. Crescent Dunes, which is beginning to look small compared to some of the upcoming projects in the industry, theoretically has 1.1 gigawatt-hours of storage capacity. That dominates Tesla’s 129-megawatt-hour battery project in South Australia, which will be the largest lithium-ion system when it's completed. And the demand for long-duration storage with CSP is growing, said SolarReserve CEO Kevin Smith. “Bulk storage, not 10 or 15 minutes but more like 8 to 12 hours, is quickly becoming a valuable attribute for renewable energy projects,” he said. Markets such as Chile, Australia, the Middle East and South Africa are regularly mandating these levels of storage to be attached to CSP, he said. Even California is discovering that bulk storage will be needed to achieve its goal of reaching 50 percent renewable energy by 2030, he added. “They won't get there by just deploying intermittent wind and PV, and are already experiencing periods where the value of energy generated off-peak is going to zero during some times of the year, and on-peak prices are climbing,” he said. But perhaps the biggest upcoming market for molten salt storage could be China. The country is taking a major interest in CSP development, joining forces with companies bidding in the Middle East and planning 1.3 gigawatts of capacity across 21 projects. These projects are designed to give China the expertise it needs to install 5 gigawatts of CSP capacity by 2020. And they are “mostly with storage,” said Cedric Philibert, senior energy analyst in the International Energy Agency’s Renewable Energy Division. These cost reductions are not much of a concern for molten salt. Unlike lithium-ion batteries, which are expected to achieve significant cost reductions through economies of scale, molten salt storage is cheap and probably won’t get much more so. “Prices are not driven by the demand in CSP, but by the conditions of the fertilizer market, which is the main application of this type of salts,” said Giuseppe Casubolo of Chilean salt vendor SQM. However, CSP plants cost a lot more than PV or wind projects. Recent tenders have seen these costs falling dramatically, and there are developments in the works that could make CSP cheaper still. If these developments succeed and the Chinese can do for CSP what they did for PV, then molten salt’s contribution to grid-connected energy, in sunbelt markets at least, could end up being much greater than many expect. Join GTM for a deep dive into the budding domestic energy storage market at the U.S. Energy Storage Summit 2017. Utilities, financiers, regulators, technology innovators, and storage practitioners will all come together for two full days of data-intensive presentations, analyst-led panel sessions with industry leaders, and extensive, high-level networking.